Salt and pepper to taste Bring a large pot to medium heat. Add the oil and place in the pot the garlic, ginger red onion, scotch bonnet peppers and thyme. Sauté for about a minute. Add the curry powder, allspice and ground cloves. Stir the mixture for about 3 minutes making sure to evenly coat with spices. Add in the potatoes and pour in the chicken or beef stock and add salt to taste. 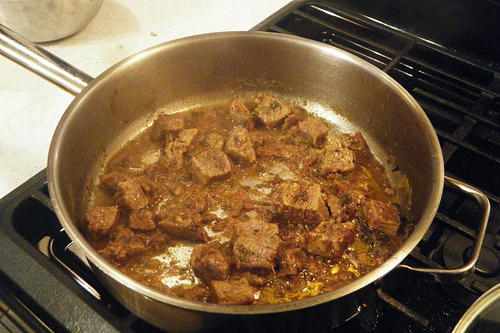 Reduce the heat to a simmer and let cook for 1 to ½ hours. Serve with rice.